Alright ladies and gents ... before you go diving into those "post Fourth of July" clearances for deals on sparklers, keep in mind that there's a tremendous difference between "wedding" sparklers and "regular" sparklers. This is actually one of my favorite types of send-offs because its fun and makes for stunning photos (if you buy the right ones of course). But as a wedding planner, I never want to see a couple's wedding dreams get ruined for something so simple so today I'm sharing a few tips on which sparklers to buy, where to buy them and how many you'll need. 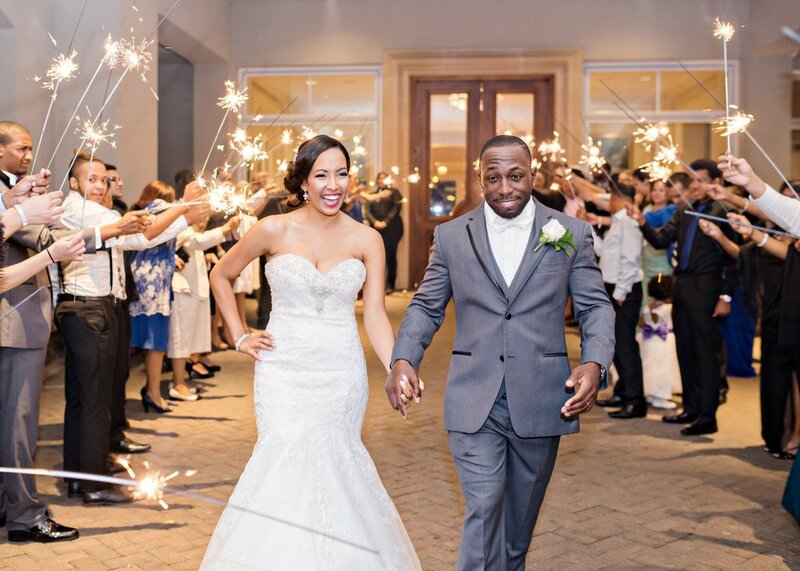 Wedding sparklers are made with a steel wire core making them smokeless as supposed to regular sparklers made with a wood or bamboo core, causing them to leave behind a thick cloud of smoke and debris (which you don't want ruining your beautiful white gown). Because regular sparklers are made of wood, they also tend to burn out quicker and in many cases have an uneven and sloppy burn compared to the steady and consistent burn of the steal wire sparklers. Sparklers R Us is one of my FAVORITE sites to order wedding sparklers. This is who I used personally for my own wedding and I was highly satisfied with their product. What I like about this site is that it's a one stop shop. You can add cute tags to go on your sparklers, a bucket to display them and confetti cannons. They're also good about running specials for 10% OFF your entire purchase and I mean, who wouldn't like to save a little extra cash, right?! Sparklers Online is also a great alternative to order your wedding sparklers. They come in 3 standard sizes and are great in quality. What I like about this site is the pretty cool blog where they share fun ways to use sparklers at your wedding and how to write with them in photos. These come in 3 different sizes: 10 inch, 20 inch and 36 inch. The 10 inch sparklers don't last very long so for a wedding sparkler exit, I recommend getting the 20 inch which burns for about 2 minutes or 36 inch which burns for about 4 minutes. Both of these allow enough time to get all of your guests lined up, get the sparklers lit and still have plenty of time to walk through and get tons of cool shots. Wedding sparklers typically come in cases of 40-50 so the amount you order will vary depending on your guest count and how long they're willing to party with you. Keep in mind that most of your guests won't stay until the very end so don't make the mistake of ordering too many. Let's say you have 120-175 guests attending your wedding, you're probably safe getting a total of 80-100 sparklers and probably have some left over. Enjoy these photos of my very own sparkler send-off! Hello beautiful! I'm Pamela Littlejohn, the smile behind Aisle Say Yes. I'm a certified wedding planner (CWP), coordinator and blogger based out of Charlotte, NC looking to create a space where brides-to-be come to learn and be I N S P I R E D ! Wedding planning is not just a passion, it's my calling and I'm so thankful you're here to share this amazing journey with me. With that being said ... Welcome to my B L O G ! Sign up for the latest wedding trends, planning tips and more! Thank you for joining! You will receive a confirmation email shortly. May 10, 2017 Should You Hire A Wedding Planner? Apr 5, 2017 You're Engaged! Now What?